One thing you will find on this blog is honesty, if an activity, menu or project just doesn't work out for whatever reason I will say! This leads me to a confession, I've blogged in the past about my seasons activities and the big list. My main goal Isidore us to enjoy 'family time' (as opposed to work & chore time) and make the most of every minute, I've tried to do this by setting tasks and activities with the seasons activities and the big list but something just isn't working. I seem to be spending more time actually thinking about the tasks and stressing about when we'll fit them in so I can record/project life/blog about them than actually spending time with my family and doing the things that make the most out of our time together. So... I've made a decision I'm stopping the fads and trying to think of a way to reinvent the wheel and I'm jumping on the 'bucket list' bandwagon. It's something that I've only come across recently and love the idea that we can all just add things to the list and if they are no achieved, so what?? I will probably keep our bucket lists seasonal as obviously there are things that we can't do out of season but I won't stress that everything has to be completed or that I need to create an album specifically to record that season. 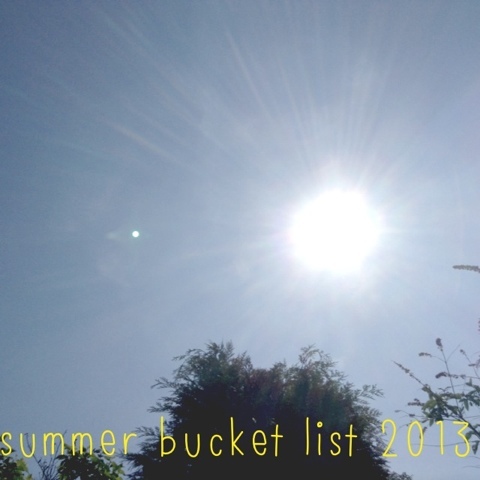 I'm sure that some of the things that are on our 'summer bucket list' can be transferred over to autumn or beyond or even adapted to make them more fun. One example is that 12 yo Hayden would like to cook a BBQ for us in the summer, I think it might be fun for him to cook sausages in the autumn around bonfire night so I've set up a list in listmaster and have added it to that, when the time comes for autumns bucket list if he wants to do it - great, if not - no worries! I feel so much more relaxed about our family activities now the pressure is off and I'm not beating myself up about not sticking to another project. I now see it as a learning curve and that I have learned to let go of the tight structure that I was trying to inforce on myself and moving on with a plan that is nice and relaxed. I probably wont bore everyone and share everything here. If an activity was a huge sucess and I think others could gain inspiration from it then I will document it and share our experience, but those won't be built into my blog schedule until after we've done it.